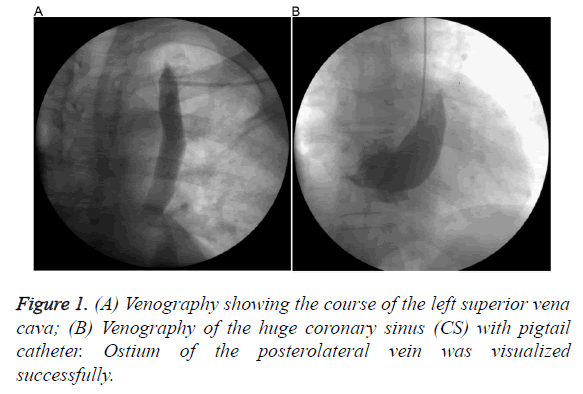 Background: Persistent Left Superior Vena Cava (PLSVC) is a rare congenital anomaly which is typically asymptomatic and discovered incidentally during device implantation. Methods: In this case, we present challenges and techniques of Cardiac Resynchronization Therapy (CRT) in a patient with PLSVC. Results: After evaluating the exact anatomy of PLSVC and Coronary Sinus (CS), we chose the appropriate approach and equipment’s. By using a J shaped stylet, a guide wire and inner sub-selection catheter, we performed implantation successfully. Conclusion: In most cases of PLSVC, successful cardiac device implantation is possible with increasing operator experience, cardiac imaging and appropriate tools. Persistent left superior vena cava (PLSVC), Cardiac resynchronization therapy (CRT), Congenital venous anomaly. PLSVC: Persistent Left Superior Vena Cava; CRT: Cardiac Resynchronization Therapy; CS: Coronary Sinus; LV: Left Ventricular; NYHA: New York Heart Association; CT: Computed Tomography; RSVC: Right Superior Vena Cava; PL: Posterolateral; RV: Right Ventricle; RA: Right Atrium; ICD: Cardioverter Defibrillator. PLSVC is the most common congenital thoracic venous anomaly with a prevalence of 0.3-0.5% in general population . In most cases, PLSVC exists together with the Right Superior Vena Cava (RSVC) and communicates to the right atrium via (CS) . Isolated PLSVC is a rare variation, characterized by dilated CS . It is typically asymptomatic and discovered incidentally during device implantation [4-13]. Transvenous placement of cardiac device lead via PLSVC can be technically difficult, and in some cases, impossible [7,14]. Although transvenous implantation of a pacemaker was reported as early as 1970s, there is still little experience with CRT implantation . Also there is no well accepted technique and equipment for such patients. We present a patient without previous documentation of systemic superior venous anomalies or congenital heart disease that needed CRTD device implantation and was discovered to have PLSVC during the implantation procedure. A 42-y old man with non-ischemic dilated cardiomyopathy, severe Left Ventricular (LV) systolic dysfunction (LV ejection fraction=28%), left bundle branch block (QRS width 170 ms), NYHA class III symptoms (on optimal medical management) was referred to our service for CRT-D device insertion. During left subclavian puncture, guide wire went through a left sided venous structure. We suspected PLSVC and procedure was delayed because of requirement for suitable equipment. A contrast enhanced CT was performed for the exact anatomical structure. It revealed PLSVC without a bridging innominate vein and poorly developed RSVC. Also it showed a Posterolateral (PL) coronary vein draining into a huge CS. We decided to implant the CRT-D from left pectoral side for more effective defibrillation and besides, patient had poorly developed RSVC. After evaluating the anatomy of PLSVC and CS and preparing the equipment, patient was taken catheterization laboratory once again. Coronary angiography was performed to identify exact anatomy of CS and suitable branch for lead insertion and it confirmed PL vein. Venography from the left subclavian vein demonstrated that left subclavian vein drains into PLSVC and PLSCV drains into CS (Figure 1A). CS venography was done with a pigtail giving contrast with low pressure and sufficient to identify the confluence of the CS and branches (Figure 1B). Because of the huge CS, posterolateral vein was selectively intubated with an inner sub-selection catheter. Firstly, active fixation Right Ventricular (RV) lead was advanced into the Right Atrium (RA) through the PLSVC and CS and the stylet was pre-shaped like a high angled J (Figure 2A). Then, a 0.038 guide wire passing through the RA, tricuspid valve to RV was used for neighbouring and guiding to facilitate passage of RV lead into the RV (Figure 2B). After the insertion of RV lead, an active-fixation atrial lead was positioned on the RA free wall. Lastly, an over-the-wire LV lead was successfully deployed through the intubated inner sub-selection catheter to a stable position in the PL vein with a capture threshold of 0.7 V and an R wave of 13.2 mV (Figure 3A). A CRT-D device was connected and implantation was successfully completed (Figure 3B). Figure 1. (A) Venography showing the course of the left superior vena cava; (B) Venography of the huge coronary sinus (CS) with pigtail catheter. Ostium of the posterolateral vein was visualized successfully. Figure 2. (A) Right ventricular actively fixed lead passing through tricuspid valve. 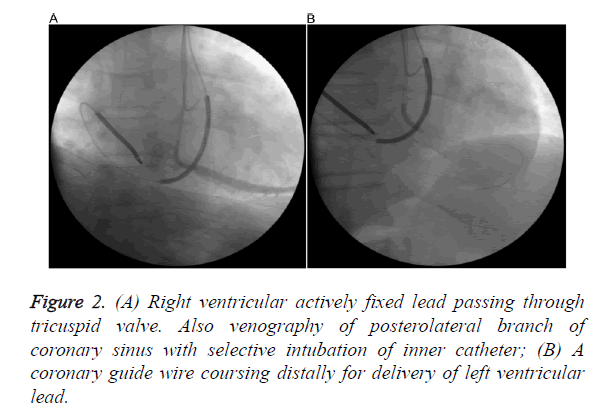 Also venography of posterolateral branch of coronary sinus with selective intubation of inner catheter; (B) A coronary guide wire coursing distally for delivery of left ventricular lead. Figure 3. (A) LV lead was introduced successfully into the posterolateral branch over the guide wire; (B) Final positions of the right atrial, right ventricular and coronary sinus leads. There are numerous case reports of successful implantation of various types of cardiac devices from the left subclavian approach in patients with PLSVC, including pacemaker (single and dual chamber), Cardioverter Defibrillator (ICD) (single and dual chamber) [16-19]. The complexity of anatomic variants may complicate CRT device implantation. Using various techniques [16,20-22] it is possible to insert cardiac leads via persistent LSVC to the appropriate site in 80% of patients [7,21,23]. The major difficulty relates to the right ventricular lead implantation, as the tip of the lead is deflected away from the tricuspid annulus . A J-shaped stylet and a neighbouring wire may overcome this problem as we did. Another major problem relates to the placing of the left ventricular pacing lead in the coronary sinus branch because of the dilated CS. Also failure in visualizing the suitable CS side branch in a huge CS for implantation increases both procedure time and radiation exposure. Although venography is not routinely required, it is helpful in order to identify the venous anatomy . If possible, using cardiac imaging techniques before the procedure and selecting the most appropriate approach with suitable tools (stylets, leads, cannulation catheters and guidewires) increase the chance of success . Options of physicians for better outcome are; pre-operative CT or MRI angiogram with contrast to image coronary sinus branches, power injection (pig tail) in the coronary sinus via left side, balloon occlusion venogram in the great cardiac vein for filling branches retrograde and left coronary artery angiogram with levophase visualization of CS branches. For this purpose we used different modalities to understand exact anatomy. CS venography with a pigtail really decreased procedure time and marked entry point for the PL vein. An inner catheter was inserted easily through this entry point. To avoid lead displacements because of the angulations between CS and RV apex, active fixation leads must be offered . In conclusion, PLSVC may severely complicate left-sided cardiac implantable electronic devices implantation and require alternative approaches for the lead insertion. However, with increasing operator experience, cardiac imaging and appropriate tools successful cardiac implantable electronic devices implantation is possible in most cases. Wood P. Diseases of heart and circulation (2nd ed). JB Lippincott, Philadelphia 1956. Recupero A, Pugliatti P, Rizzo F, Carerj S, Cavalli G, de Gregorio C. Persistent left-sided superior vena cava: integrated non-invasive diagnosis. Echocardiography 2007; 24: 982-986. Peltier J, Destrieux C, Desme J, Renard C, Remond A, Velut S. The persistent left superior vena cava: anatomical study, pathogenesis and clinical considerations. Surg Radiol Anat 2006; 28: 206-210. CC Fang, Jao YT, Han SC, Wang SP. Persistent left superior vena cava: multi-slice CT images and report of a case. Int J Cardiol 2007; 121: 112-114. Girerd N, Gressard A, Berthezene Y, Lantelme P. Persistent left superior vena cava with absent right superior vena cava: a difficult cardiac pacemaker implantation. Int J Cardiol 2009; 132: 117-119. Jiang M, Shen XD, Zhou SH, Mao JL, He B. Clinical consideration of cardiac pacemaker implantation through a persistent left superior vena cava with an absent right superior vena cava. Int J Cardiol 2012; 159: 59-60. Ratliff HL, Yousufuddin M, Lieving WR, Watson BE, Malas A, Rosencrance G. Persistent left superior vena cava: case reports and clinical implications. Int J Cardiol 2006; 113: 242-246. Funabashi N, Asano M, Komuro I. Giant coronary sinus diverticulum with persistent left superior vena cava demonstrated by multi-slice computed tomography. Int J CardioL 2006; 111: 468-469. Korantzopoulos P, Kolios M, Nikas D, Goudevenos JA. Implantable cardioverter defibrillator lead placement in the right ventricular outflow tract in a patient with Brugada syndrome and persistent left superior vena cava. Int J Cardiol 2015; 181: 166-168. Roberts DH, Bellamy CM, Ramsdale DR. Implantation of a dual chamber pacemaker in a patient with persistent left superior vena cava. Int J Cardiol 1992; 36: 242-243. Cheng Z, Deng H, Cheng K, Chen T, Gao P, Fang Q. Implantation of a pacemaker in a patient with persistent left superior vena cava and absence of right superior vena cava. Int J Cardiol 2013; 168: 53-54. Dilaveris P, Sideris S, Toutouzas K, Gatzoulis K, Stefanadis C. Dual-chamber pacemaker implantation in a core valve recipient with a persistent left superior vena cava. Int J Cardiol 2013; 166: 519-520. Lim PC, Baskaran L, Ho KL, Teo WS, Ching CK. Coronary sinus ostial atresia and persistent left-sided superior vena cava: clinical significance and strategies for cardiac resynchronization therapy. Int J Angiol 2013; 22: 199-202. Wu Q, Yu S, An YP, Chen BL. PCI techniques to aid implantation of CRT-D in a senior patient with persistent left superior vena cava. J Geriatr Cardiol 2016; 13: 639-642. Rose ME, Gross L, Protos A. Transvenous pacemaker implantation by way of an anomalous left superior vena cava. J Thorac Cardiovasc Surg 1971; 62: 965-966. Meijboom WB, Vanderheyden M. Biventricular pacing and persistent left superior vena cava: case report and review of the literature. Acta Cardiologica 2002; 57: 287-290. Sankhla BV, Shah M, Lokhandwala Y. Left-sided biventricular pacemaker implantation in the presence of persistent left superior vena cava. Indian Heart J 2010; 62: 344-345. Kapetanopoulos G, Peckham FK, Clyne C. Kluger J, Migeed MA. Implantation of a biventricular pacing and defibrillator device via a persistent left superior vena cava. J Cardiovas Med 2006; 7: 430-433. Lane RE, Chow AWC, Mayet J, Davies DW. Biventricular pacing exclusively via a persistent left-sided superior vena cava: case report. Pacing Clin Electrophysiol 2003; 26: 640-642. Biffi M, Boriani G, Frabetti L, Bronzetti G, Branzi A. Left superior vena cava persistence in patients undergoing pacemaker or cardioverter-defibrillator implantation: a 10-year experience. Chest 2001; 120: 139-144. Zerbe F, Bornakowski J, Sarnowski W. Pacemaker electrode implantation in patients with persistent left superior vena cava. Br Heart J 1992; 67: 65-66. Mattke S, Markewitz A, Dorwarth U, Hoffmann E, Steinbeck G. Defibrillator implantation in a patient with a persistent left superior vena cava. Pacing Clin Electrophysiol 1995; 18: 117-120. Biffi M, Bertini M, Ziacchi M, Martignani C, Valzania C, Diemberger I, Branzi A. Clinical implications of left superior vena cava persistence in candidates for pacemaker or cardioverter-defibrillator implantation. Heart Vessels 2009; 24: 142-146. Atar İ, Karaçağlar E, Özçalık E, Özin B, Müderrisoğlu H. Implantation of resynchronization therapy-defibrillator device in a patient with persistent left superior vena cava. Turk Kardiyol Dern Ars 2015; 43: 368-371.